Welcome to the SESG website where we showcase just some of the events we either put on or take part in. If you are affected by epilepsy and would like to join us or just have a chat then please come along to one of our informal coffee mornings. 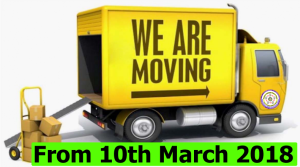 Note: From the 10th March we will be located at the Holiday Inn Hotel, Swindon Centre. Take the lift to the Reception area we will be allocated one of the function rooms. One of our Memebers, Chloe decided she'd like to do a bit of fund raising and awareness work for our group, with help from Friends & Family she organised a number of activities and events to promote our group including an event at the Southbrook Inn where they had multiple stalls including; Glitter tattoos, Henna tattoos, Hair chalk, Hair braiding, tombola, Guess the sweets in the jar, Break world records, Beat the goalie and Guess the name of the teddy bear. Also some friends from Chloe's New Colledge Swindon group took part in a sponsored walk around the churches of Swindon. 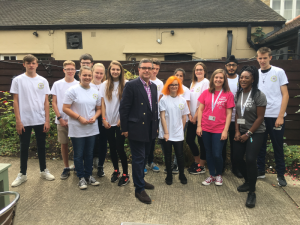 Both MPs for Swindon,Robert Buckland and Justin Tomlinson come along to lend their support and help in publisisiing the event. See our Gallery for the Photos. Each year we take some of our club members away for a fantastic day trip on the Kennet & Avon Canal organised by our friends at Phoenix Rotary Club, The trip is on the Bruce Trust flagship barge, the Rebecca which can carry up to 10 passengers plus the crew. 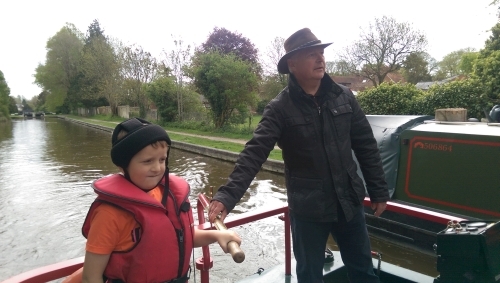 Rebecca is crewed by a trained team from the Rotary Club who encourage everyone to take an active role in our day, everyone will be operating locks, throwing and tying off ropes and steering the barge, even our youngest members get to operate the locks and steer! The barge is 18m long and over 3m wide and weighs in at about 20 tons so is a lot to handle.This year's event was a great success and we look forward to repeating it next year. 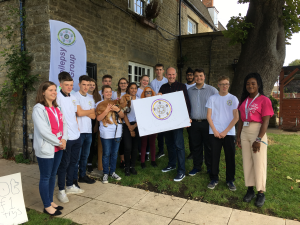 Took place this year Rosie one of our fantastic members on the spur of the moment decided it would be a great idea to raise awareness for the group in Swindon and a little moneyduring National Epilepsy week. Rosie’s idea was to take part in a head shave, to make the most of this great and brave idea our friends at the Phoenix, borrowed a vacant shop in the middle of the town centre on a lively Saturday and acquired the services of two top stylists form Goldsworthy’s hairdressers and a face painter for good measure. 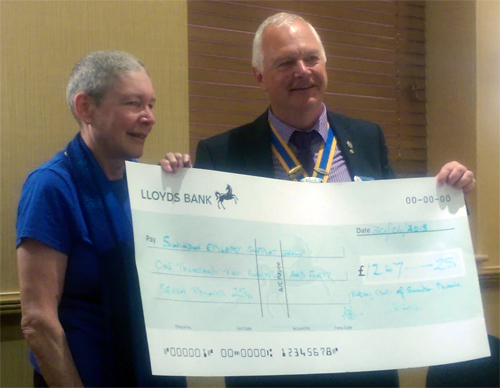 The event was a great success and Rosie was flabbergasted with her publicity in the Swindon Advertiser and at the final sum raised a awesome £1247.25. 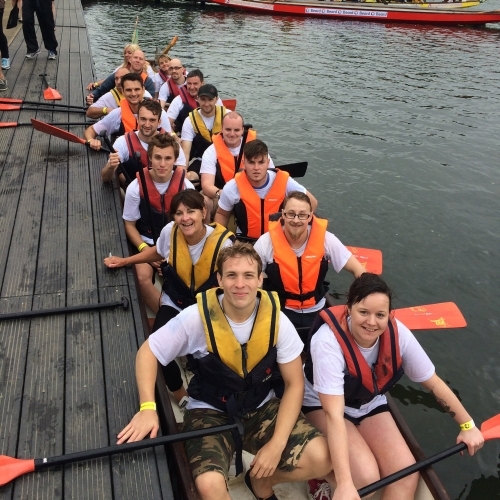 The Purple Paddlers have taken part in every Swindon Dragon Boat event at Coate Water Country Park. Our a team of 21 willing volunteers represent our group for this fantastic day out, the event is well attended by the people of Swindon as spectators so it is a great day out and showcase for the any charity wishing to join in and raise some funds for their club or charity. We also run a stall at each event and have many interested visitors stop by for a natter. This is always a great family day out with plenty to do and see apart form the racing. We can't wait do do it all again next year!